Dynamics 365 can help an organization manage fairly complex Service commitments to customers by using Entitlements and SLAs. However, if your needs aren’t all that complex, you may want to evaluate Using SLAs instead of Entitlements in Dynamics 365. The tricky part is that by looking at the out-of-the-box Case form/configuration, you may think you have to use Entitlements. We recently had to take a look at this on behalf of a client in the software industry. In their situation, they have several levels of Support but each Case is assigned a Priority level based upon the details of the Case, not upon a pre-defined agreement with the Client or the type of Product, etc. They also don’t limit the number of incidents. Trying to fit them into the ‘Entitlement’ model was not working well. Well, what do entitlements offer? For organizations that need to manage Support based on one or more of the above factors, Entitlements are great. Maybe you just need to ‘start the timers’ when a Case is created and monitor how long it’s taking your staff to achieve that first response/other process milestones – whether it’s due to Contractual reasons or just so you can keep improving your Customer Service. You may not have individual agreements regarding response times or the numbers of incidents and you may not have different support policies for different products or don’t want to restrict who contacts you for support. 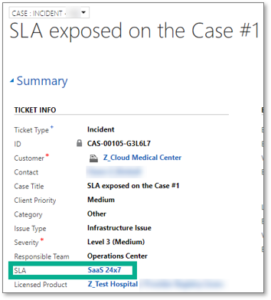 Microsoft realized that not everyone needs the Entitlement framework and so a few versions ago they added the ability to directly expose a lookup to the SLA entity on the Case. Which means you don’t have to use an Entitlement just to associate an SLA with the Case. This provides much-needed simplicity and functionality for smaller service organizations. By remembering that we could simplify the out-of-the-box configuration on the Case in order to concentrate on the benefits of the SLA timers/metrics rather than living under the structure imposed by Entitlements was of great help and prevented us from trying to come up with workarounds that would have been inefficient. Searching the net for ways to do things that aren’t out-of-the-box may provide you with a solution that is still OOB but just needs to be ‘revealed’! !